Posted by letsdrinkon in At Your Service REWARDS, Baltimore, Baltimore Ravens, Bars, Dining - Restaurants, EAT. PLAY. LIVE., Food & Wine, Foodies, Lawfully IMBIBE, Leisure, Let's Drink On, Maryland, Party On, Preferred Partners, Signature Cocktails, Work. Life. Balance. .75 oz. Pumpkin spice liqueur. Add the ingredients to a shaker with ice in the order listed above. Double strain into a martini glass. Garnish with foam and grated nutmeg. Take the spring from a Hawthorne strainer, place it in a shaker. Add .5 oz. of egg whites. 1 large egg is 1 oz. (2 tablespoons). So you can either take out 1 tablespoon or buy a cartoon of egg whites. Add .75 oz. of Evolution Brewing Jacques All Lantern. .25 oz. of Pumpkin Spice Liqueur. Garnish the foam with freshly grated nutmeg. Birroteca is a cool restaurant located in a unique old industrial area of Baltimore called Clipper Mill. Birroteca is known for its artisan pizza and Italian cuisine. It is worth the visit. Nick who is in the video, uses the same creativity in his cocktails that he uses in ceramic arts. Nick has been in several videos already, so be sure try those as well. Nick Ramey is the creator of this delicious signature cocktail and many of the other cocktails you will find at Birroteca. Like many of the bartenders we work with his knowledge of the different brands of alcohol and how they mix with other ingredients is extensive. So you are pretty much guaranteed to get a great cocktail. This Signature Cocktail is a perfect cocktail for the fall and Halloween Parties. The cocktail has a nice balance of bitterness and spice. Posted by letsdrinkon in At Your Service REWARDS, Baltimore, Baltimore Ravens, Bars, Dining - Restaurants, EAT. PLAY. LIVE., Food & Wine, Foodies, Lawfully IMBIBE, Leisure, Let's Drink On, Lifestyle, Maryland, Party On, Preferred Partners, Signature Cocktails, Work. Life. Balance. Choose your berries and add them to a pint glass. For this cocktail use 2 blueberries, 1 blackberry and 1/2 of a strawberry. Add .5 oz. of lemon juice and the .5 oz. of agave. Then add the basil leaf, blueberry vodka and ice. Pour into a Collins Glass. Add more ice to Collins Glass and top off with soda water. Garnish with several speared berries. Birroteca is a pretty cool restaurant located in Baltimore. It has a unique location in an old industrial area of Baltimore called Clipper Mill. Birroteca is known for its artisan pizza and Italian cuisine and is well worth the visit. Nick Ramey, who is featured in the video, is the creator of this signature cocktail. He uses the same creativity in his cocktails that he uses in ceramic arts when he’s not behind the bar. Nick has been in several videos already, so be sure to check out those drinks as well. Like many of the bartenders we work with, Nick’s knowledge of the different brands of alcohol and how they mix with other ingredients is extensive so you are guaranteed a great cocktail every time. The mix of the berries, blueberry vodka and basil leaf with the soda water makes this a light and refreshing cocktail with an upfront blast of fruit and a nice herbaceous twist. Posted by letsdrinkon in At Your Service REWARDS, Baltimore, Baltimore Ravens, Bars, Dining - Restaurants, EAT. PLAY. LIVE., Food & Wine, Lawfully IMBIBE, Leisure, Let's Drink On, Lifestyle, Maryland, Preferred Partners, Signature Cocktails, Work. Life. Balance. •Using a Collins glass add the serrano slices (without the seeds), lime juice, and agave. •Muddle the ingredients in the glass well to break up the serranos. •Add ice, then mix up the cocktail well. •Top off with soda water and garnish with lime wheel. This cocktail is perfect for your next cookout. It is refreshing and has just a little bite as the lime subdues the serrano. The first sip has a subtle taste of the tequila, then cocktail becomes very smooth. A great cocktail on a hot day! 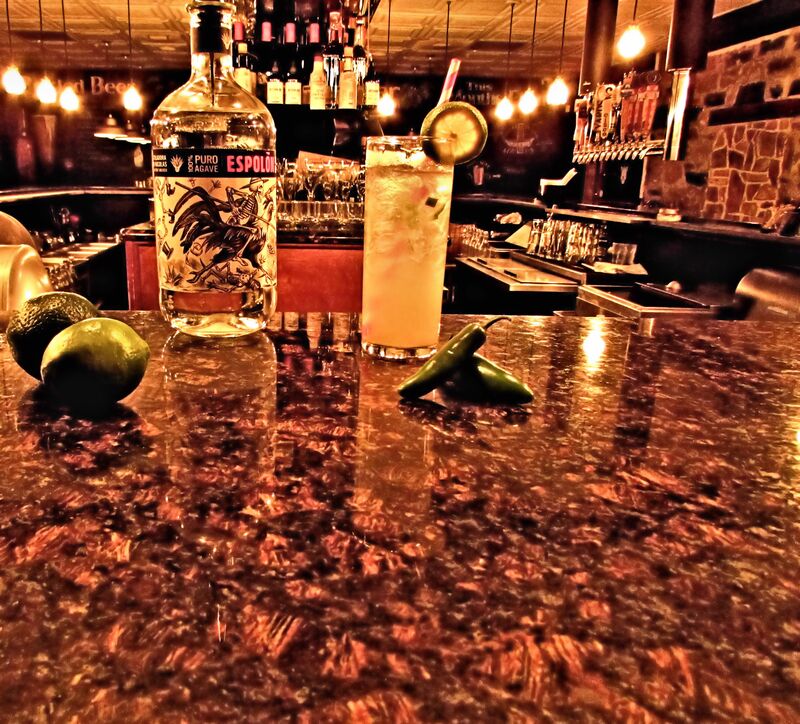 Nick Ramey is the creator of this spicy cocktail and many of the other drinks you will find at Birroteca. Like many of the bartenders we work with, he has extensive knowledge of various brands of alcohol, and how they mix with other ingredients, so you are pretty much guaranteed to get a great cocktail every time! •Cut strawberry in half and add to Old Fashioned Glass, then add the mint leaves, sugar cube and lemon juice. Then muddle the ingredients. •Pour strawberry rhubarb shrub and Turning Point Rye into glass, then add ice. •Using a shaker to shake ingredients. •Bring sugar and water to a boil, then add strawberries and rhubarb and boil for 20 minutes. •Add apple cider vinegar and boil for 5 minutes. •Let it cool and strain. •Refrigerate for up to one month. Birroteca is a pretty cool restaurant located in Baltimore. It has a unique location in an old industrial area of Baltimore called Clipper Mill. Birroteca is known for its pizza and pasta and is worth a visit. Nick, who is in the video, uses the same creativity in his cocktails that he uses in ceramic arts. This cocktail has a nice taste of strawberry with a slight hint of the mint. The Turning Point Rye is very smooth and light, which makes it a great summer cocktail. 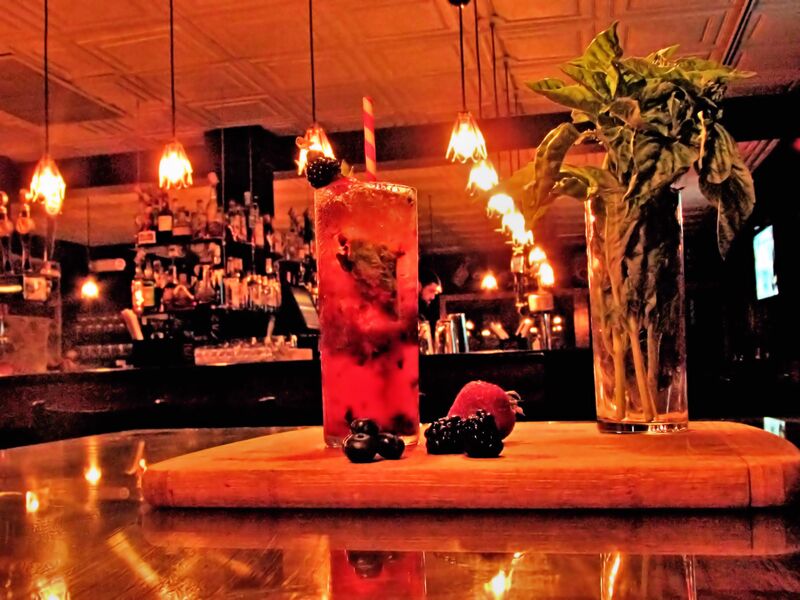 Visit http://www.letsdrinkon.net for our many other signature cocktails.